What is the purpose of a newspaper? Reuters blogger Felix Salmon recently wrote about what he saw as a hypothetical business opportunity for the cash-strapped New York Times: namely, selling early access to news scoops like the paper’s expose on Walmart. The idea drew a fair amount of criticism (including some from me), and that critical reaction said a lot about where newspapers find themselves now, as digital pressures require them to look for new revenue opportunities. When all is said and done, what is the ultimate purpose of a newspaper — to make money, or inform the populace? In my response to Salmon’s proposal, I said that I thought such a move would place the New York Times in conflict with at least some of its core principles. By selling access to potentially market-moving stories — some of which would theoretically also have a public-policy element or some other broader social value to them — the NYT would be sacrificing (in some sense at least) its commitment to readers and public journalism in return for subscription revenue from stock traders. Is private access in conflict with the public interest? Salmon in turn argued that it isn’t really important *when* regular readers get access to news stories, and so it wouldn’t matter if the Times sold early access to its scoops and then gave them to everyone else later. But it’s not hard to think of examples where these two would be in conflict — what if there was an investigative story about a prescription drug that had dangerous side effects, something that might affect the share price of the drug company? Who gets to see that story first, the general public or the hedge funds? Others have argued that since we trust the NYT to do the rest of what they do — to report stories honestly, etc. — then we should be able to trust them to decide which stories are of broader public interest and which are not. But there have been cases (such as Judith Miller’s reporting on Iraq) where that trust has broken down, and as a commenter on Salmon’s original post noted, selling hedge funds access to certain stories would raise even more questions about who the paper is more beholden to, readers or large institutions. The core of the problem is that the New York Times is a strange sort of hybrid animal, just as most other major-market newspapers are: it is a profit-oriented corporation, controlled by the Sulzberger family and other investors such as Mexican billionaire Carlos Helu, and therefore its purpose is to make money. But at the same time, it has also become a kind of public institution as well, with a commitment to informing the citizenry about important events, upholding the public’s right to know, etc. That’s part of the reason why incidents such as the Miller case are criticized so heavily. 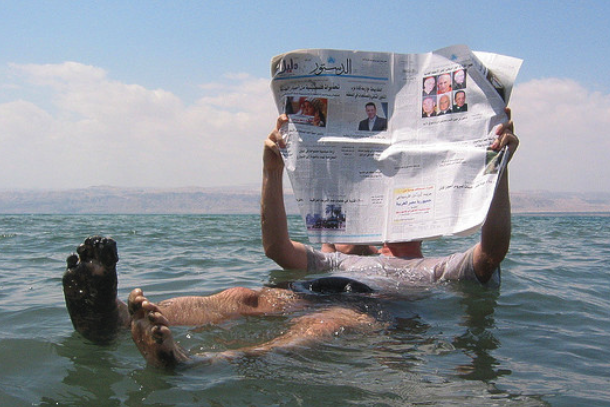 Should newspapers do whatever it takes to make money? In a way, newspapers have only themselves to blame for this turn of events. In the early days of the industry, no one really expected newspapers to be engines for protecting the public good. Their job was to sell as many papers as possible, and publishers like William Randolph Hearst did whatever they thought would accomplish that goal, including making stories up out of whole cloth, just as some “tabloid” newspapers still do now. But in the 1960s and 70s, newspapers became a massive industry with corporate owners, who wanted to appeal to national and international advertisers and readers — and as part of that process they became public institutions, something that was accelerated by the Watergate scandal and the role that the Washington Post played in it. In many ways, that helped create the idea that newspapers should protect and uphold certain public principles for the good of society. So the problem now is that newspapers are trying to charge readers more directly for their content than they ever have before, and by definition that restricts the number of people who can read it. If a paper erects a paywall that costs $15 a month, that’s one thing — but what if it’s a subscription plan designed for hedge funds and bond traders? If that is a newspaper’s central focus, hasn’t it given up any hope of being a public entity or keeping the interests of society at heart? In some ways, general-interest papers seem to be damned if they do and damned if they don’t. Maybe the days of mass-market newspapers with a broad readership are simply coming to a close, and what we are seeing is some of those newspapers evolve into controlled-circulation subscription newsletters, who serve the interests of their small readership and nothing else. And perhaps that isn’t such a bad thing — other solutions could theoretically take their place, or at least help share the load when it comes to the public interest. But the long-term effects of that remain unknown. We’ll be talking with leaders in tech, media and investing about how to make the most of today’s opportunities, blurred lines and all, at paidContent 2012: At The Crossroads, May 23, at The TimesCenter in New York. Join us. Print has felt the impact of technology. A mind shift is happening, the author of this is on point. Why pick up the paper, when you view it or tweet, my bad blog too. “When all is said and done, what is the ultimate purpose of a newspaper â€” to make money, or inform the populace?” <– Well, I suppose that's the problem: Their purpose must be to do both. It seems the struggle is figuring out how much of one side to compromise for the other side. I have NEVER understood why a something called a NEWS-paper would offer free access to all stories for the first 15-30 days– and then lock it behind a wall and charge $2.95 to get in. I used to subscribe to a Computer Security NEWS-letter called “Virus Bulletin.” Subscribers could read articles as soon as they were published– everyone anyone could read them for free after 90-180 days. Which pricing model makes more sense for stories about, say the NFL draft?? Excellent article and worth some thought. I wonder where you would put Bloomberg and it’s terminals for hedge fund operators who pay to get the earliest information about market moving events. Bloomberg seems to be doing ok in the profit department and no one is crying foul of their ethics or responsibility to the public good. Same horse, different color perhaps? Love it! America’s wealthiest institution, the government, will be buying and controlling media. I’m going to China! Society will pay for journalism, one way or another. They’ll either buy subscriptions or they’ll suffer from increased corruption. The problem is that society is cheap. I don’t know why newspapers are facing yhis problem. The core business of newspapaers has been miney from. Advertising. And that’s what they should continue to push. All papers/magazines can be made available via a one time purchase of an App (of course they can expect customersto BUY upgrades rather than get them for free). Thereafter, beautifully placed advertising will get them the money they want. Ad Agencies had honed the skill of well made entertaining craftful ads for print as well as TV. They have to learn to do the same for digital. Also media houses like starcom etc have to realise that they are selling digital advertising for very very cheap. Compared to readership, its still very cheap. If a magazine can charge X Dollars for an ad that people will turn the pgae over, why not digital. People really have to think and respond positively to this external stimulus. Citizens benefit because they continue getting their daily news. Journalists benefit because they get paid for what they love. App developers benefit because they develop apps and get paid. Newspapers benefit because they vastly improve cisculation. These days it seems to me that newspapers need to justify themselves by running campaigns instead of doing journalism. What journalism there is left is polluted by sensationalism. wow…I love where this conversation is going! Yeah…I told Rolling Stone they can go — themselves. They were basically telling me I couldn’t write for the New York times and I bascially told them I’m going to make my own site, post my OWN nudes – and beat them at their own game. I will write for anyone who needs writing. Just email me the assignment. Here is another big question to ask? What is truth? Yes, its a loaded question. But I meant it seriously. The value of the newspaper industry is that they peddle “Truth” When folks find their own truths (blogs, twitter, facebook etc), do they need the official “truth”? This article has an interesting secondary theme: what are core principles and how do you address conflicts between core principles? I don’t believe there is a common understanding of what core principles really are. However, most people sense that they are based upon the application of common, deeply-held values. 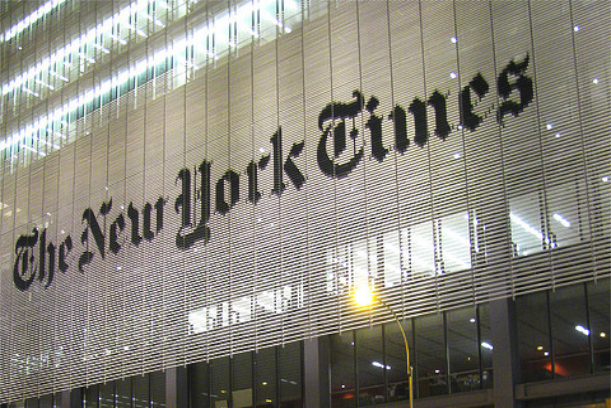 For the NYT and the newspaper industry, their core principles are being tested by societal changes brought about by technology. Media companies are in the business of creating and delivering useful, interesting content. They compete with bloggers, tweeters, YouTubers, etc. who don’t necessarily have a profit motive or necessity. The NYT and other media companies have existing relationships (subscribers, employees, advertisers, etc.) that are, in my opinion, their most valuable assets. It’s up to them to adjust their principles in order to remain viable; it’s up to them to operate as humane, principle-driven businesses. As human beings, I would love to see us all embrace a principle that we would inform others when there is danger or potential harm looming. For the most part, I think we all can be “good neighbors” (looming natural disasters have demonstrated that the vast majority of us react this way). It would be great if that responsibility would supercede the principle that an entity like the NYT needs to optimize its profitability in order to fulfill its mission. What’s necessary is high-minded, principle-driven leadership driving a humane, principle-driven enterprise in a way that creates and sustains a caring, principle-driven culture. So to me, the big question is “Where’s the leadership”? Kudos to Salmon for coming up with some ideas. And to you for acknowledging the friction at the heart of the modern urban newspaper. Newspapers could only “comfort the afflicted and afflict the comfortable” while they enjoyed a local monopoly on news distribution. We’re approaching the time when the choice will be no paper at all if alternative revenue models are found. I’m old enough to feel that would be a loss for the public at large. Tiered service is better than none at all. In a sense, aren’t Sunday only subscribers saying they don’t mind paying less, and waiting longer, for their news? As long as there are people who grew up reading the Sunday paper, there will be a market for that product. How long that remains a viable product…(blank). The NYT is in the communications business, distributing ideas (some information, a lot of entertainment, and some public service). The “principles” upon which the newspaper industry evovled are shifting because of technology. The fact that making money can clash with a commitment to inform the public about what I would consider “essential” information can be addressed with a new principle that places what’s essential for the greater good immediately ahead of what’s important for long term economic viability. Now for my personal opinion on the matter … a free press is essential for any democratic society ~ that newspapers are under threat of bankruptcy is a dire situation which needs to be rectified … the easiest way to resolve this would be to unconditionally subsidize newspapers ~ unconditionally, meaning no strings attached, no government oversight or regulation, so as to maintain a free press. It would be tax money well spent. But there is always a threat that newspapers would fall to the influence of outside parties when it becomes “subsidize”. Take NPR and PBS for an example (although it’s not a newspaper). They attempt a fair approach, yet every year face threats of losing funds from a political party because the views aren’t fairly represented. As soon as journalism does it’s job and calls out injustice and false statements from anyone, that party or individual will find ways to even the score. There is no such thing as a subsidy with no strings attached. Anything subsidized by the government would include it’s implicit approval, which omits essence goes against the public interest. There is no such thing as a subsidy with no strings attached. Anything subsidized by the government includes its implicit approval, which in its essence contradicts the idea of a free press. I don’t understand your point about subscriptions somehow implying closed or narrow communities. Newspapers have never been able to survive on newsstand sales, have always relied on subscriptions and delivery for a consistent revenue base, and in particular for a consistent number of eyeballs to view the advertising that was the real economic engine of publishing. There are plenty of differences in internet delivery – the lack of newsstands, a global audience that doesn’t attract local advertising, etc. – but the subscription model isn’t one of them. Frankly I don’t understand this discussion in terms of principles. In the pre-digital world newspapers “public service” was always restricted — to those who could buy a copy or a subscription. Those who didn’t would know about the news “later”, if ever; usually when/if another paper, a radio or a tv station picked it up. Weird that gigaom would be asking this question seeing as they have NEVER been profitable. An interesting concept, unfortunately it reeks of desperation. Not much different than the retailer losing business jacking their prices to make up for losses only to drive their remaining customers away. There are better ways to deal with these problems. There are viable revenue models & it is possible for investigative journalism to flourish (with pay) once again. But the decision makers absolutely must open their minds, they must draw upon the truths & proofs they already know and guide the digital transition with logics. It boggles my mind to think of the millions of dollars being wasted on inefficient experiments simply because the industry leaders know the right people. I have the right answers but don’t yet know the right people… I’m working on it. When I’m done with it we will see around us a reformed industry where the public at large, businesses, newsrooms & journalists will all benefit in the ways that they each need to benefit most. It’s taking longer than I had hoped but it will be worth the wait! If you want to stay posted on the progress follow me on Twitter. Not sure why you’re worried about the risk. It’s merely a return to the roots — that’s how “journalism” started out, as semi-clandestine providers of analysis of what was going on for neighboring Princes. Thanks for the comment, Ric. That’s a fair point — although it’s interesting that even in their earliest incarnation in Europe in the 1600s, newspapers were quite public and were used to spread the news of important events like wars and battles in other countries. Modern “news” has two basic roots: journalism, as above, and “pamphleteering”, use of the printing press to support political and/or ideological campaigns. Of late, it’s become apparent that The Media are pamphleteering with gusto while maintaining a veneer of journalism. The fall in newspaper revenue can in large part be traced to people’s resistance to pay for political advocacy. Jehovah’s Witnesses don’t charge for the materials they distribute. It isn’t clear why the NYT (e.g.) should charge for pro-Democratic Party (or at least anti-Republican) propaganda. I have a soft spot in my heart for traditional newspapers. I cut my teeth in the IT world working for the Tribune Company in the 90’s. It felt great to be part of something that provided a public service and at the same time extremely profitable. These companies are too big to change quickly enough to continue providing the quality traditional reporting that we are accustomed and please their stakeholders. I’d like to say no that they shouldn’t sell advanced access to information or even start down that slippery slope. But this is a mature industry and changing the business model in this fast moving environment is going to bumpy and I suspect there will be additional changes we will not like. I’m a believer in “other solutions could theoretically take their place”. As long as there continue to be people writing the stories that deserve publication in the public interest, the Internet is now there as the printer and distributor. I imagine it will be much tougher in future to get a job as a full-time journalist, but the same number of articles can be written by a large number of part-timers who may not even hope to gain any money but just research and write because they have some personal motivation to do it. Probably the most interesting thing I’ve read today I found at some fairly mainstream site — but when I followed something like four levels of link all the way back to the original article it turned out to be at one person’s blog, ItsOkayToBeSmart.com. Okay, that’s “interesting” rather than “in the public interest”, but in general I find that these days any subject I care about is being covered by independent authors and then picked up and rebroadcast by others. Thanks, Rohan — I definitely think there are more potential solutions and alternative sources than there used to be, but at the same time I believe that we are at risk of losing something Important if the NYT and other papers become controlled-circulation newsletters for the wealthy. And if we lose that, what will happen? Then you are part of the future :-) thanks for the comment.